So what’s the difference and is there a difference? 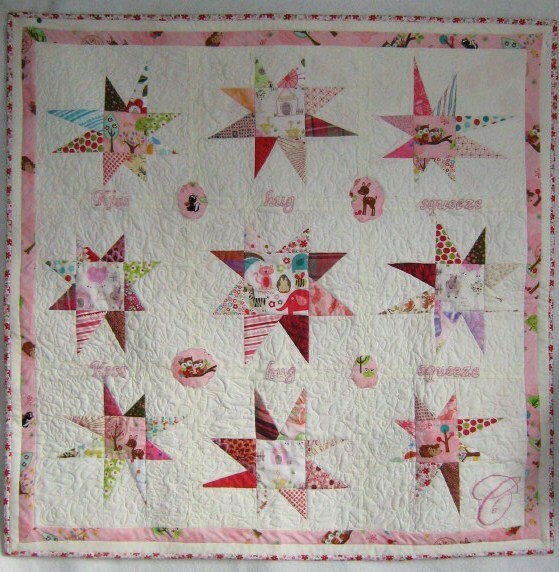 There certainly is a trend towards Modern Quilting and possibly away from traditional quilting. I understand there has been a marked reduction of traditional quilts of entries to both the Festival of Quilts and National Quilt Championships and certainly at Ardingly last month most of the quilts were either arty or modern with a few traditional from Sandy Lush . Why is that? Today – a traditional quilt tends to be a series of same blocks or a couuple of blocks, which work together, made with same or different fabrics which together make a quilt. The blocks are quite often standard blocks and occasionally is often a series of repetitive tasks to make it with the key to being a very wonderful quilt is the workmanship in making it AND the quilting – be it hand or machine – is outstanding. So what is Modern Quilting? Really difficult to answer. Over the last few years, manufacturers and designers are creating fabrics that are modern and inspiring by being very different from traditional fabric patterns. Such designers as Kaffe Fassett, Amy Butler, David Butler and Aneela Hoey have brought fabrics into the 21st century and about time to. Comtemporary quilts tend to be Art Quilts, I believe and often contain other media besides fabric (Lutrador and other fabric like items). I believe they are made for show or for sale and why not! Most good quilters traditional or otherwise, would like to sell their work and make a decent amount, given the amount of time it takes to make any quilt. Would love to hear any ideas and comments are welcome! Hope to hear from you!